I thought this week I would do a W theme. I have several items I want to post about that are all W’s; this first one is Warblers. In the last couple of weeks we’ve had lots of warblers returning and settling in. One of the species that seems to be singing somewhere every time I go out on a walk is this one, the Black-and-white Warbler. They are an abundant species on the rough Canadian Shield, but also found more sparsely throughout much of the rest of Ontario. They nest in deciduous and mixed woodlands, which are extensive in this region. The habitat type is also increasing in Ontario, as abandoned fields slowly return to forest, and they’re one of a number of warblers dependent on such habitat to show a statistically significant increase in the most recent Breeding Bird Atlas. 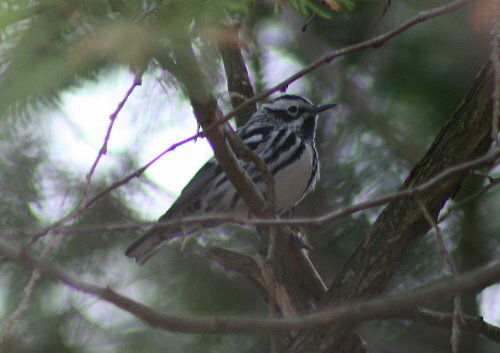 Black-and-white Warblers have a distinctive foraging style, climbing up tree trunks and along branches a bit like a nuthatch; indeed, some earlier names for the species included Creeping Warbler, Pied Creeper, and Black-and-white Creeper. This one’s a male because it is crisp black and white, with a black throat; females lack the dark throat and are more grayish than black. 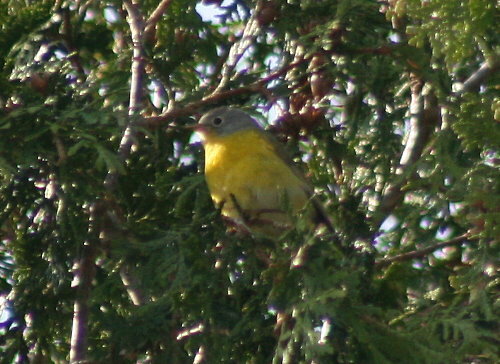 Here’s another species we’ve seen a fair bit of: Nashville Warbler. Like the Black-and-white, they’re found through much of Ontario. They have a preference for mixed or coniferous forests, and all of the encounters we’ve had with individuals on apparent breeding territory have been in patches of evergreens. They’re flashy little birds, with a gray hood and bright yellow belly. In our region of the province their population seems to be stable, probably because regenerating forest here is mostly deciduous, which doesn’t affect them too much given their habitat preferences. 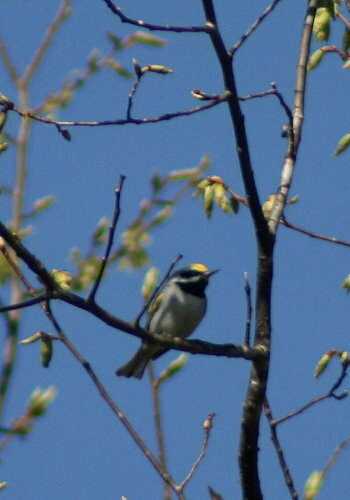 Yellow-rumped Warblers should be breeding in our forests as well this summer. They’re one of the most abundant migrants in the spring, but most of them carry on past us and head for northern Ontario, and especially northwestern Ontario where they have the highest densities. Like the Nashville, they prefer coniferous and mixed forests, but are less picky than Nashvilles, making do even with small patches. Their population, interestingly, has been on the rise in our region; presumably it’s this generalist nature that allows them to take better advantage of small opportunities. There are two subspecies of Yellow-rumps, one with a yellow throat, and the other with a white throat. 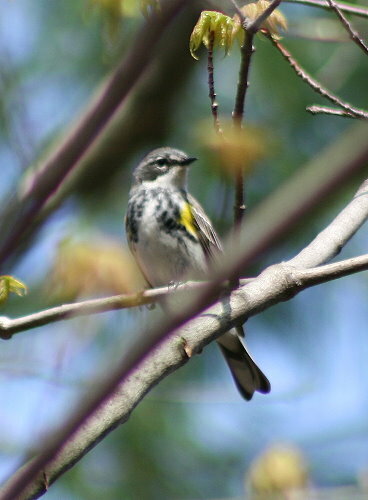 Ours has the white throat, and was known as a Myrtle Warbler before the two species got lumped into one. Many birders affectionally refer to them as “Butterbutts” for their namesake plumage feature. 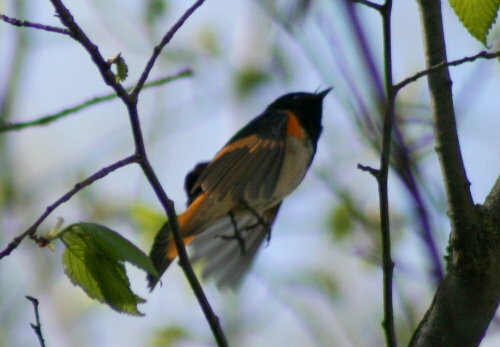 American Redstarts such as this handsome male are fairly common in much of Ontario. They are very much the generalist, nesting in open and semi-open treed habitats, usually successional forests but occasionally more mature forests if they are very open or have large clearings (like along roadsides). Another species that’s on the rise, the mature males are unmistakable in their smart black-and-orange plumage. However, they don’t actually attain these colours until their second summer; their first summer is spend as a drab brownish-gray like the female. Though these young males will occasionally still try to sing and defend a territory where they’re able, not all will attract a female and mate. There is some debate as to why some species do this, but often it’s associated with maximizing breeding success. In such species, often first-summer males who are inexperienced in holding and defending territories will have very low success compared to more experienced males. Most, if they mate at all, do so through surreptitious forays into the competitor’s territory while he is away for adulterous liaisons with the competitor’s wife. Their dull plumage helps them to fly under the radar, since from a distance they just look like a female, who doesn’t attract the attention that black-and-orange plumage would. The female, for her part, is interested in these sneaky encounters because sperm from many males helps maximize the overall fitness of her clutch; it’s more likely that some of her offspring will succeed through survival of the fittest than if they come from a single parent. She hedges her bets – rather than all or none, she goes with the less risky all or some. And finally, a species that is much less common in the region, but which has a stronghold in the Frontenac Axis, one of just a handful such areas in the province, the Golden-winged Warbler. It is a species in decline, one of the most rapidly disappearing in North America, and listed as Threatened in the province. It is being outcompeted by the closely related Blue-winged Warbler, with which it hybridizes in zones of overlap between the two species. Historically in the province, Golden-wings were more northern in range, and Blue-wings more southern; the first Blue-wing wasn’t recorded in the province until the early 1900s, but have continued to expand northward since, pushing the Golden-wing out of the southwestern regions where it was once more plentiful. Hybrids are fertile and usually backcross with one parent species or the other, further diluting the species pools (this does lead to the question of whether they are even separate species at all if their offspring are fertile, or if they’re simply two subspecies with very different plumages). Compounding the problem is loss of habitat on both summer and winter grounds, and nest parasitism by the Brown-headed Cowbird, which favours the same open, scrubby habitat the Golden-winged Warbler likes. Beyond just these five, we also have Cerulean, Pine, Black-throated Green and Yellow Warblers, as well as Ovenbird and Northern Waterthrush, back on territory around our house. We can probably expect them to be joined by Chestnut-sided, Magnolia, Black-throated Blue, Blackburnian, Prairie, Mourning, and Canada Warblers, Common Yellowthroat and Louisiana Waterthrush, all of which are also found in the habitats of Frontenac Provincial Park and surrounding area. Twenty breeding species, what a smorgasbord. Although we won’t encounter all of those during our MAPS surveys, we will probably see most, and I’m really looking forward to those field days. Just wondering if you ever see blue throated black warblers in eastern hemlock areas? You are not so far north that there are no good sized stands of hemlocks, are you? Just curious. I know I’ve seen them in Quebec.